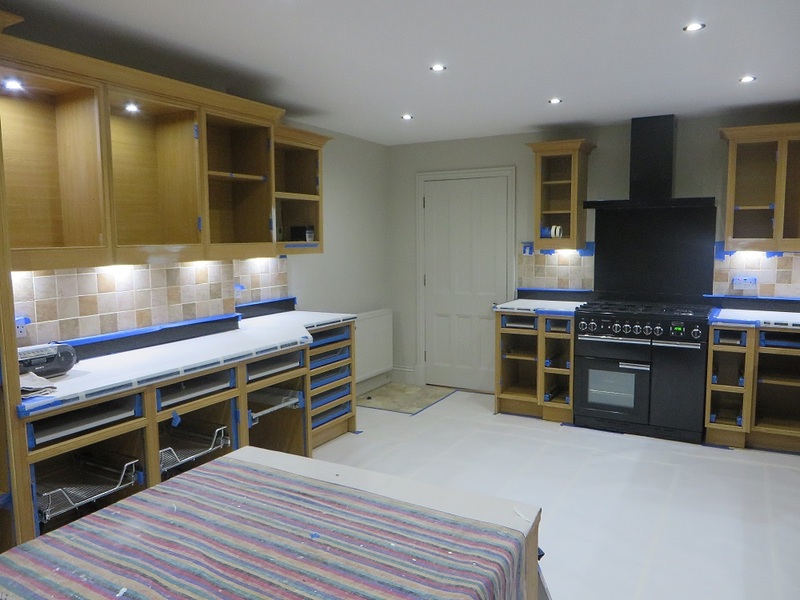 This hand painting kitchen project was commissioned by a couple in Collingham, near Leeds. 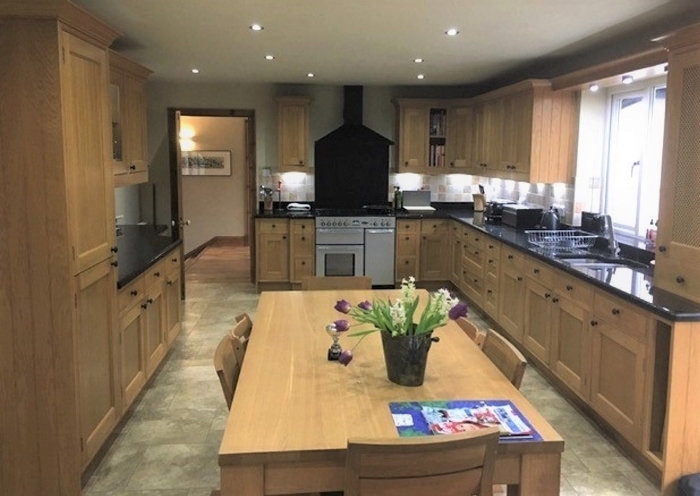 They had inherited the kitchen when they bought the house and were keen to update it, feeling that the large amount of wood was dominating the room, making it feel rather dark and dated. 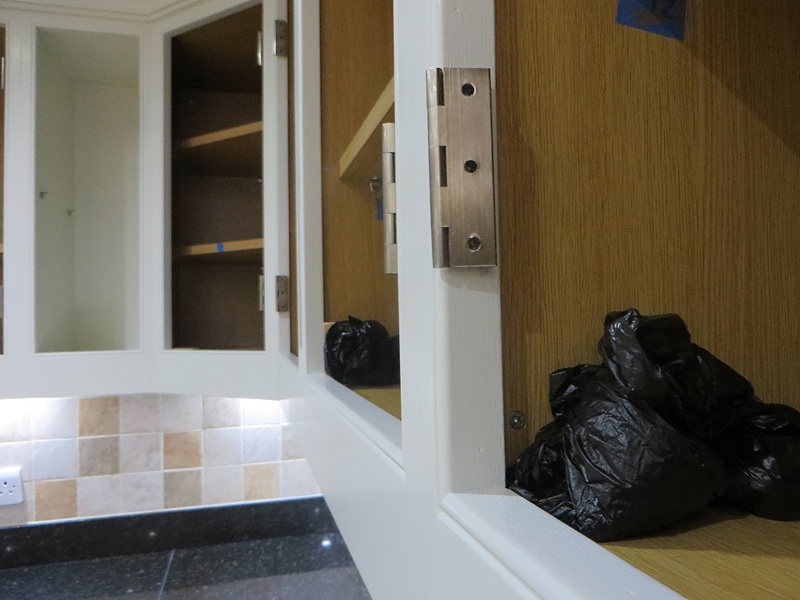 The cabinetry work was second to none, with each section having been beautifully hand made. The wood itself was ‘pip’ oak – a wild hedgerow tree that differs from ordinary oak due to it’s characteristic curly grain and ‘cats paw’ pin knots. The clients originally contacted me by phone, having seen my work on the web. 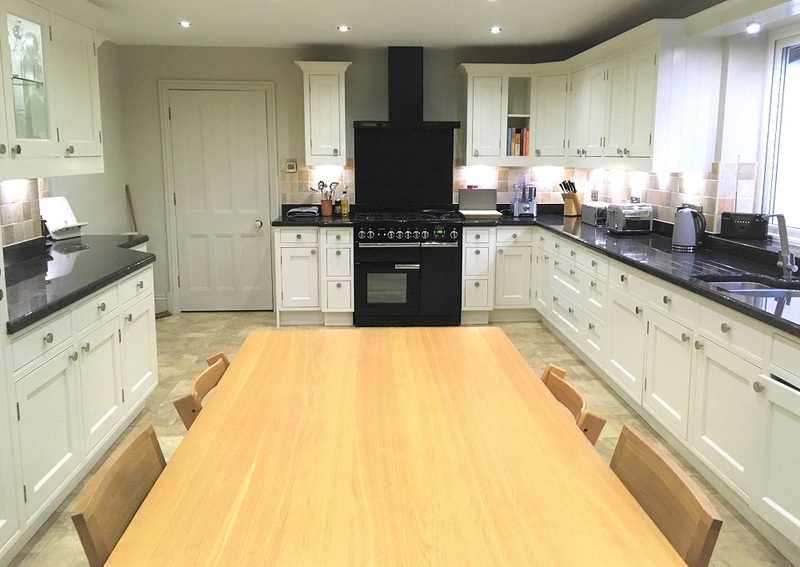 They asked various questions about the feasibility of painting a ‘pip’ oak kitchen, the processes used, the longevity of the finish and what their choice of colours would be. 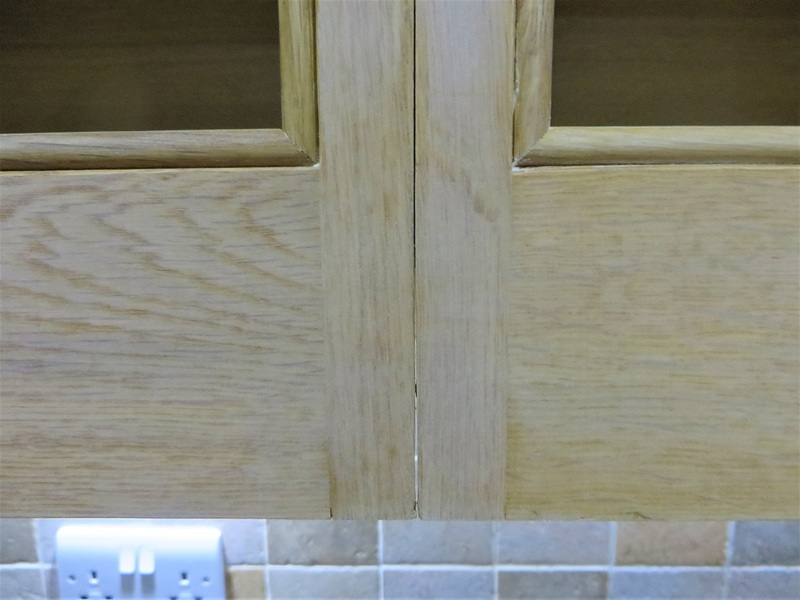 I explained that painting a pip oak kitchen was definitely possible and only differs from painting a ‘standard’ oak kitchen in that all the holes need to be thoroughly filled and sealed to get the best finish. 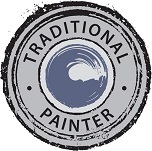 I explained that my process was extremely thorough and that the paint system I use is highly durable and can be accurately tinted to any colour they wanted. 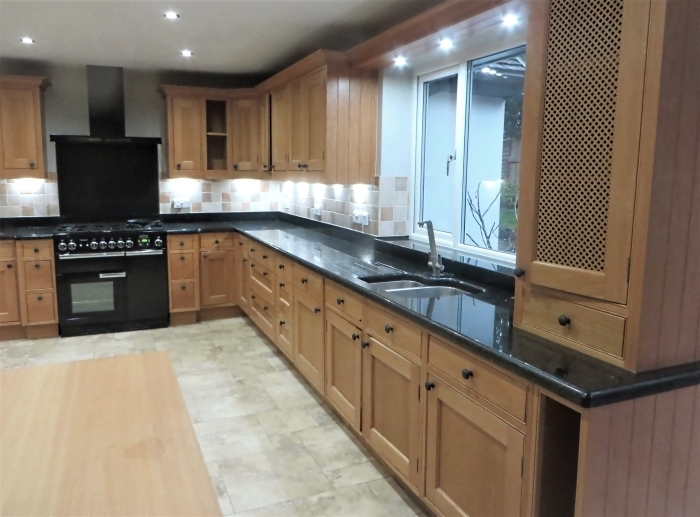 After receiving some photos of the kitchen I send a detailed estimate by return and in due course arranged a consultation. 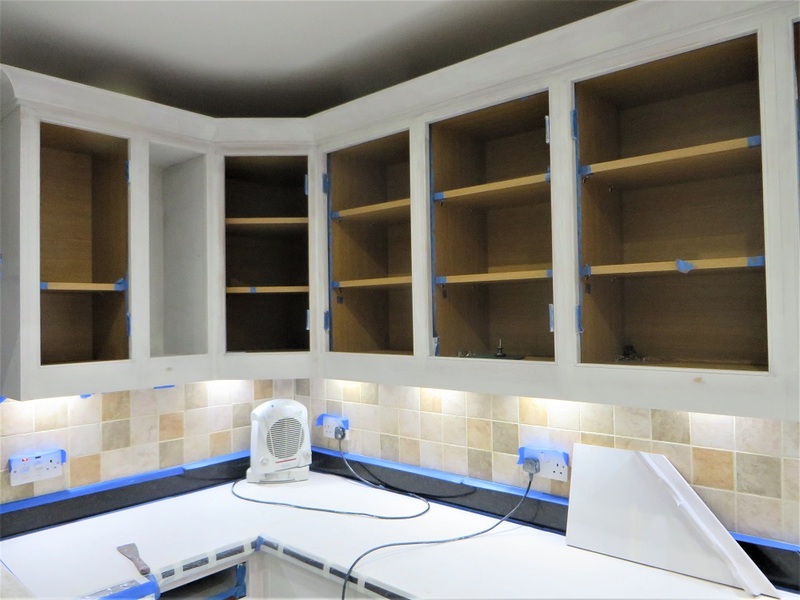 During the consultation I had a good look over every aspect of the kitchen and pointed out that some initial joinery work would need to be done prior to the painting. 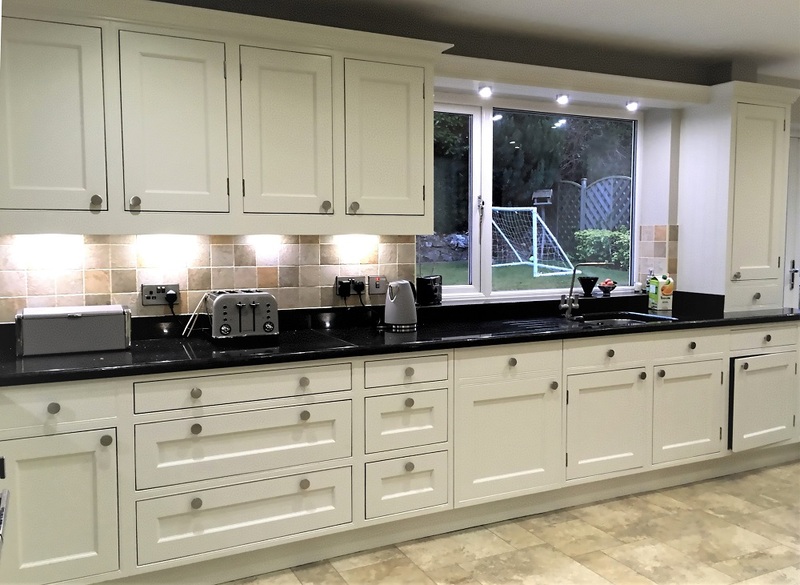 Pre-joinery work is very common with kitchen projects, and as a result I work closely with Colin Foggin, (CF Joinery Harrogate – 07931 430849) who takes care of all things joinery before I begin painting. 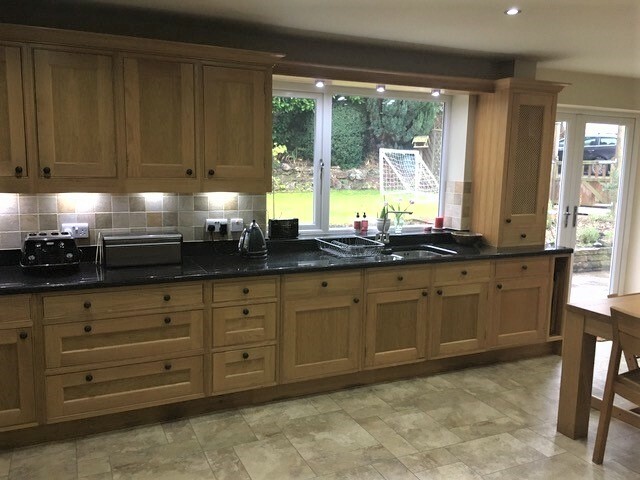 As I mentioned above, the kitchen was extremely well made, so well made in fact that there wasn’t much of a gap between the doors and the frame. This meant that once it was painted they may rub as there would be 8 coats of paint, 4 on the shell edge and 4 on the doors edge. All the doors would need to be planed first to allow for this. 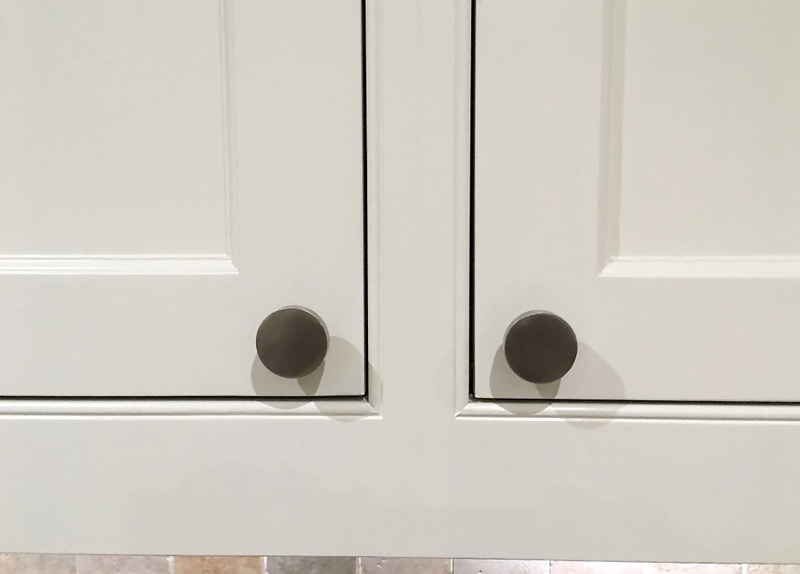 The clients also wanted to change the handles; a simple thing that can make a huge difference to the overall look of a kitchen. 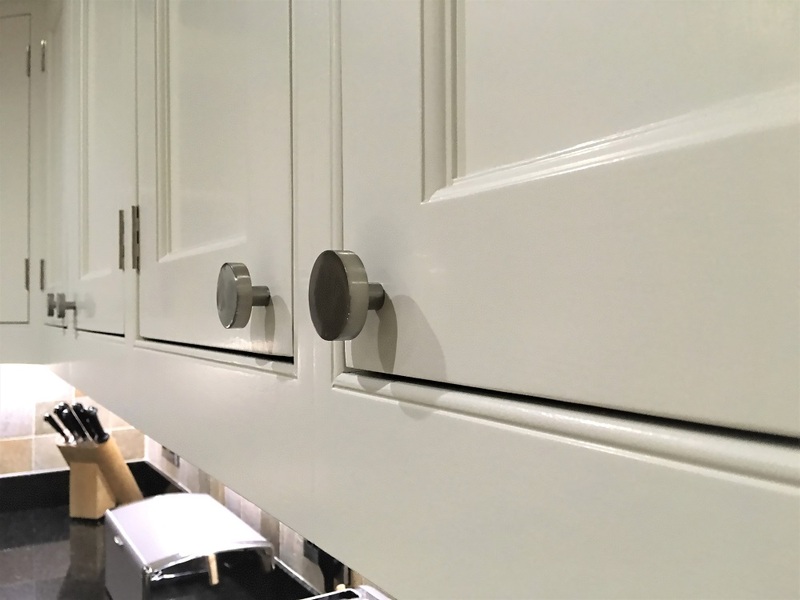 They were looking at new brushed silver knobs, which meant the original brass hinges would need to be replaced as well. Silver and brass is not a great combo. 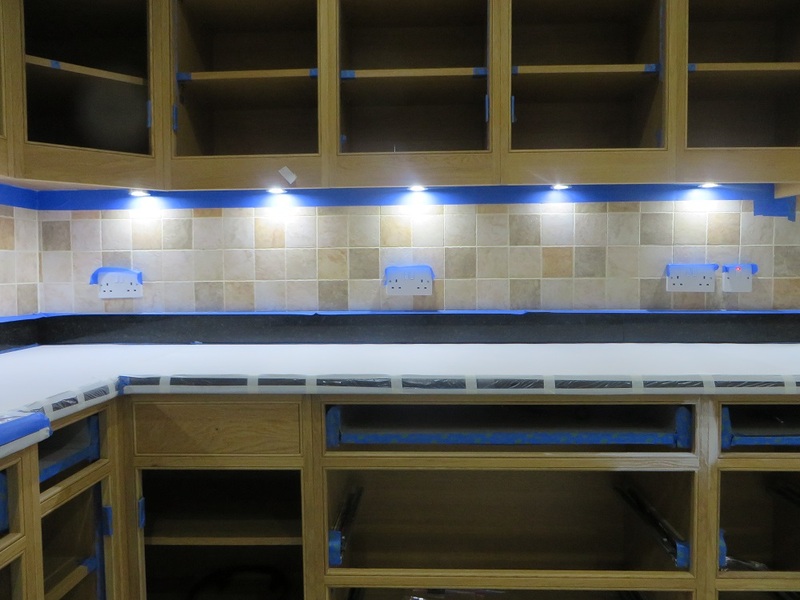 As with any kitchen project, preparation is the key. 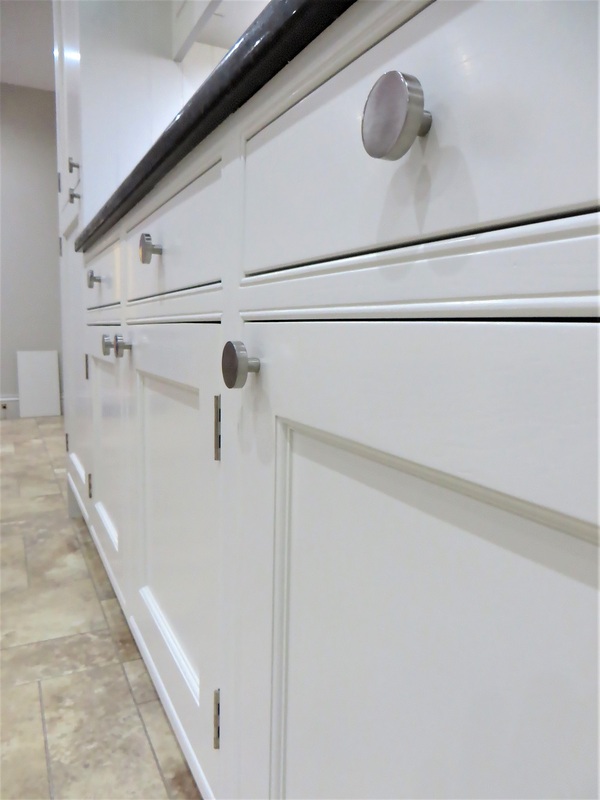 After removing the handles, knobs and most of the cabinetry hardware, I thoroughly cleaned all areas with a cleaner/degreaser to remove all traces of dirt and grease. Any spots of grease or dirt that are left means the the paint won’t properly adhere to the surface. 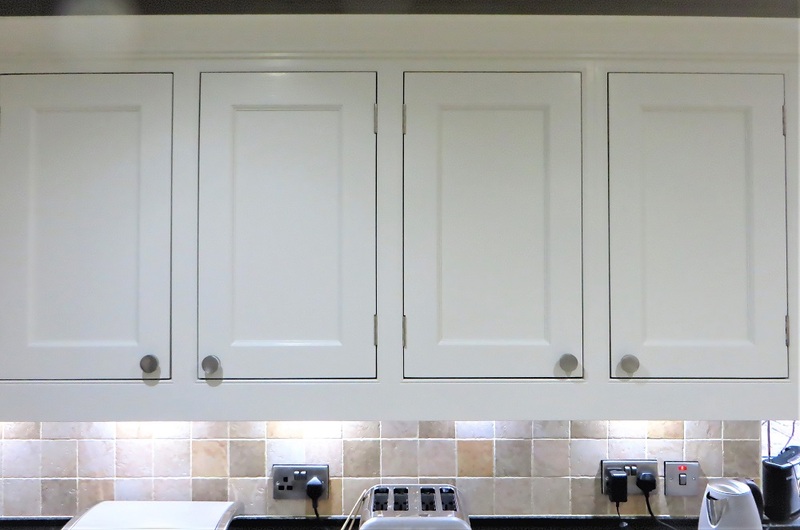 I then removed the doors ready for painting in my workshop but left the hinges on the frame so as to make re-hanging as easy as possible – ‘in line’ kitchen doors can be tricky to re-hang so this makes it all as easy as possible. Once cleaned I started masking everything off. I used ‘Tape & Drape’ (plastic sheeting with bulit in tape) on the worktops and then covered this with 1200 lining paper. 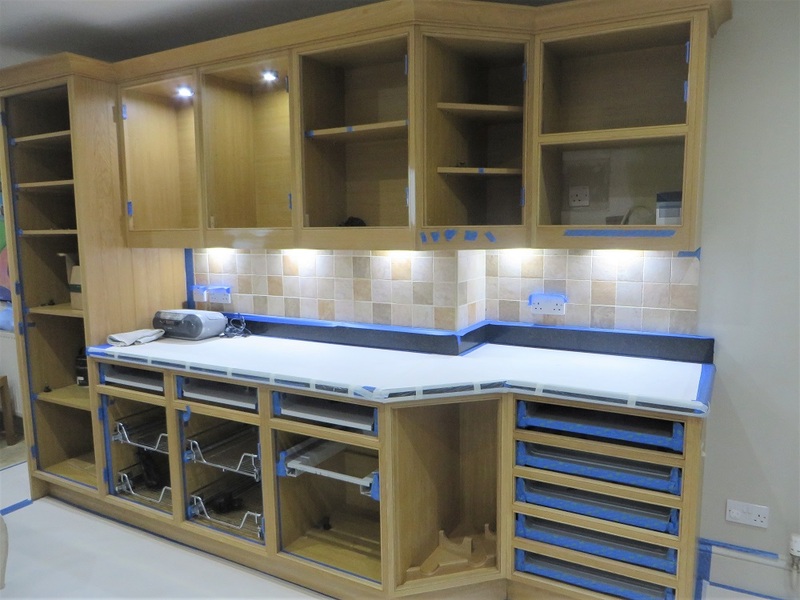 If there were any spillages then this system means that worktops can’t get painty. I also masked off the floor, the tiles, the shelves, the hinges and various other areas. This allow me to concentrate entirely on the painting and not worry about paint getting anywhere it shouldn’t. Lining paper used for masking off, not dust sheets! Once cleaned and masked I thoroughly sanded back the oak to create the perfect key for painting. I didn’t need to remove all the varnish as my primers are high adhesion and very effective, a good key is pivotal though. I then filled all the holes, knots and gaps with 2-pack filler, normal filler and caulk respectively. I then sealed all the knots with Zinsser B-I-N, a shellac based stain blocking primer and painted everything with this same primer to negate any tannin issues caused by the oak. Once the first coat of primer had been applied, I sanded everything back so it was silky smooth and applied a second coat of a different high adhesion primer, which I had tinted to the same colour as the top coat. After a light sand (each layer is sanded to ensure maximum adhesion and an ultra smooth finish) I applied two coats of Helmi 30, a highly durable water based paint that has a lovely satin finish. After removing all the tape, tidying up and tickety booing that was the shell complete. Now it was time to take the doors to my workshop, prepare and paint them. Shell completed, just the doors and drawers to do now! 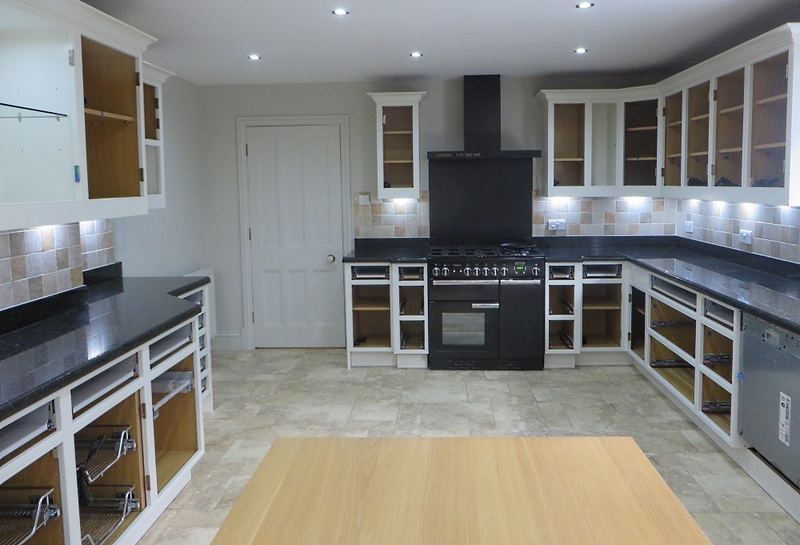 The finished hand painted kitchen, quite the transformation! 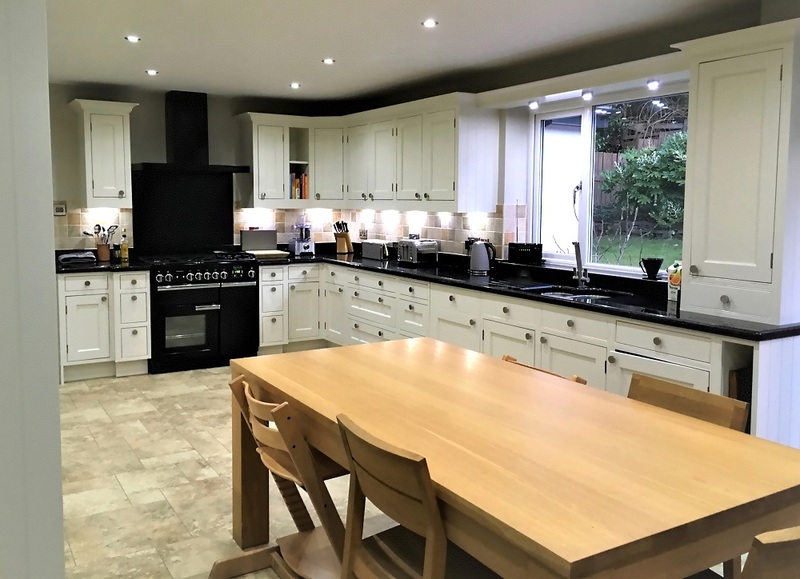 Lee works throughout Yorkshire and the UK and is within easy reach for projects in Collingham, Leeds, Barnsley, Wakefield, Halifax, Pontefract, York and the surrounding areas.